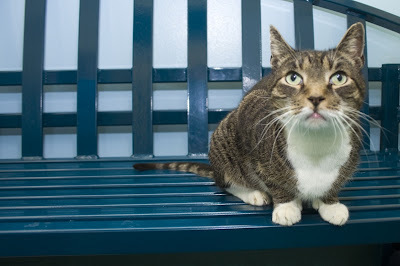 Maddox, here, is the cat who made me almost cry (due to his strong resemblance to my beloved cat, Buster) during the Cat Handling class at my local Richmond SPCA. 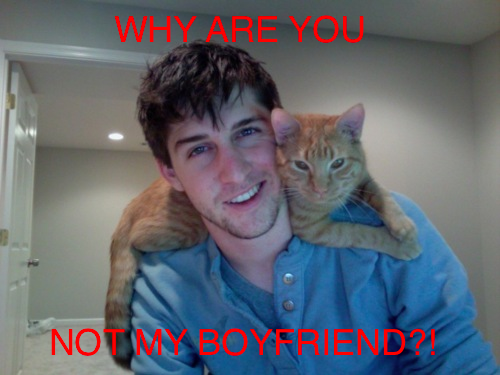 Yeah, and he's also responsible for me posting this photo of a cute guy and his cat. Naturally, my curiosity being piqued, once I got home from the shelter that night, I did a little Google searching of this handsome boy, who'd dramatically caught my eye. And that led to something unexpected - that I promptly verified through the SPCA*. And, wouldn't you know? Guess who's curled up in a cat bed, on top of the people bed, in my bedroom? Why, as a matter of fact, it's Maddox! We're fostering him for the next four weeks! *Turns out, Maddox has been a shelter resident for a few years (including at least one failed adoption). He is a senior, at 9 years, on a strict prescription urinary diet, has extra toes on his front feet, and is a little bossy. He has been in foster care a few times (to give him a break from the shelter) and, coincidentally (or not), was due to be placed in a foster home again when I inquired about him. You all have a restful (and cool) weekend! Looking forward to hearing about Maddox. Have a lovely Saturday. Maddox is one gorgeous cat! And I admire you so much for fostering! Thank you so much for giving him a break from the shelter life. He's so handsome. Please give him a head rub from me. Ohhhh, someone already said the words "foster failure" so I think you're jinxed. I love that Richmond is no kill and would allow that great boy to find his way into your home for a few weeks of vacation. Have fun! Are you telling us that lightning can strike twice in the same place? Congratulations! He is definitely adorable. I hope you enjoy your time with him! I am sure he is thrilled to be exploring a new temporary home.